View This Post on The Website. Memories - 26 years ago ... Looking through my photo gallery for some photos for our son, I saw the album from a week long Wilderness Journey we took in Utah back in October 1989. They had to drive us in on jeep and then we hiked 13-18 miles a day for different "events." Never saw another person out there. Apparently it's VERY MUCH WILDERNESS and that's why they call it a Wilderness Experience. Our son, Benjamin, had this 3-week experience scheduled at 10-years old with the son of a friend of ours who was over the program. We joined him on the last week. This was primitive type camping which meant leaving the area the way you found it. Even ashes were packed out. No bathrooms, no toilet paper, no showers, and drinking water from the stream, etc. had me in a very uncomfortable setting. Exciting experience (hmmm...), especially on the last day when we got back to the hotel room and took a shower. I still look at toilet paper and say, "Thank You, Lord." It's so much better than juniper bark. The photos were taken with a print film camera and scanned in. The one you see here is me on part of the ropes course they had us do. 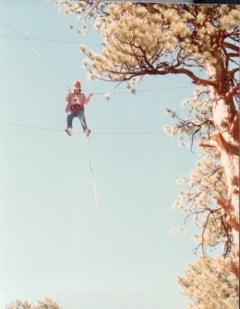 I had climbed 40 feet up a huge pine tree to get to the ropes I was to walk across to the other pine tree. Can't say any of us made it, but I'm sure we got the "experience" down pat in our minds. We were so 'blessed' to be able to experience all the challenges that Ben had experienced other than being left out overnight with only the stars and Jesus to talk to. There was actually a counselor nearby, but he didn't know that at the time. It's one of those "rights of passage" things to do when you live in such a wild area. Tidbit - Sugar Alternative - There have been so many synthetic sweeteners hit the grocery shelves and in products that I've lost count. Fortunately we have no problem since we got off sugar back in the late 70's and have used wild honey ever since. I do know that there's a definite need for something natural that doesn't spike blood sugars for diabetics, so when I saw a clip on a product called "Erythritol" I gathered a bit of info to pass along to y'all. It's a pure, non-GMO, pleasant tasting natural sweetener, zero calories, low glycemic impact and naturally sweet. Critters - Praying Mantis - The word mantis comes from the Greek "mantikos," which means prophet. They certainly do look mysterious and spiritual when they have their forelegs together as if they were in prayer. The coolest thing about this bug is that it has the ability to turn its head around 180 degrees which gives it another mystical trait. You can approach from behind and watch it turn its head to face you. Not to mention that those bulging "cheeks" which are actually eyes on the mantis make its facial appearance so cute. It kinda takes the fear of bugs right out of you. Most of the 2,000 species of mantises live in tropical environments. Only 18 of them are native species for the North American continent. They come in a variety of colors and some actually mimic flowers that they rest upon looking for prey. The ones in the U.S. are typically green or brown in color. Their wings have a leathery look that folds over their abdomens at rest. They prefer to walk around rather than fly, positioning themselves for the next meal. Although sometimes mentioned as a beneficial insect since it eats insects, it is not discretionary and will eat other beneficial bugs as well as those we consider pests. When they lay eggs the egg case over winters and hatches a new brood of tiny praying mantises. With their coloring they easily hide amongst the foliage of plants until it's time for an attack. 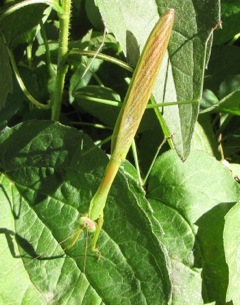 View more information on the Praying Mantis with photos of them mating and of the egg case. Tidbit - Power of Words - Are you in for an intriguing, slightly weird experiment? I write a lot about what we speak and how we think because the Bible has a lot to say about it. Such as .... "The tongue has the power of life and death, and those who love it will eat its fruit" (Proverbs 18:21). In other words, whatever we speak, we will be eating the fruit of it, or whatever it produces, life or death in our lives. Keeping in mind death isn't always about dying. Things around us can look very dead in many of life's circumstances ... and we all know people who speak all their problems out to as many people as will listen (and we're all in that group at one time or another). I have a relative who believes the world is against her and nothing can go right when you deal with people. She has definitely eaten those words all of her life. Back to the experiment .... what you do is boil rice, but instead of eating it, put some into each of two jars with tight lids filling about half way ..... mark one LOVE and the other one HATE. Then speak to them according to the label they wear. I did say it was kinda weird ... but if you want to know the outcome for one of many who have done this experiment ... visit this website. Have you heard of Emoto's experiments with water being exposed to words, prayers, music and environment. Emoto hired photographers to take pictures of water after being exposed to the different variables and subsequently frozen so that they would form crystalline structures. The results were nothing short of remarkable. Check it out! Pollinators & Birds - I haven't been able to walk in the garden much this year but we have filled the deck that is beside the screened porch (where I live and work all day) with flower pots that attract a lot of butterflies, bees, wasps, and birds for the bird bath. I rescue bees and wasps from the bird bath on a regular basis. I can see the water rippling a bit and that's when I know something is struggling to get out. I just dip my finger in so they can climb on it and then watch them do a drying dance to get all that water out of places they don't want it. Many wasps have the cutest of faces. Speaking of bees ... beekeepers won the battle against Dow and the EPA. Federal appeals court ruled in favor of beekeepers, revoking the EPA's approval of neonicotinoid insecticide, sulfoxaflor, produced by Dow. In a blunt opinion, the court cited the "precariousness of bee populations" and "flawed and limited data" submitted by Dow on the pesticide's effects on beleaguered pollinating insects. The agrichemical industry, as a whole, is flawed. The EPA needs to start protecting people and environment instead of the profits of big industry (note Tidbit section below on Kellogg's cereal containing pesticides and herbicides. Read the entire story. Sadly, I also find moths that have not made it till somebody could rescue them since they fly about at night when I'm asleep. Isn't it amazing that every living thing needs water. Humans are 60% water. By the way, if you'd like a deck garden, here's an article, Build A Deck Garden, I wrote back in August 2010 on creating one. Ours has grown and there's not a missing spot that's not well used. 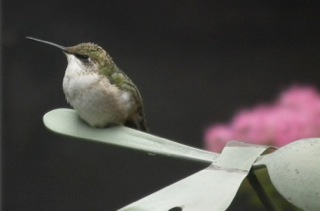 Since I'm always on the lookout for any rescues, I've always got my eyes on the deck and one day the female hummingbird that feeds at our backyard feeder was sitting on a garden stake that I had sticking in a pot. I love to see metal artwork. My neighbor has given me several stakes that have been recycled from other objects. This one with the female Ruby-throated Hummingbird used an old spoon for a body and it was "just right" for this hummingbird to keep near the feeder to battle any visitors. That's one thing I don't like about hummingbirds. They're not social critters as I mentioned in a previous newsletter. Since I had a lot of information in that newsletter you can read about it in that issue: More About Ruby-throated Hummingbird. Tidbit - The Structure Of A Forest - We look at forests as beautiful and peaceful places to rest, meditate and enjoy the sights and sounds of nature. We think of them as tree-filled space, but forests are habitats in which the trees are the dominant form of vegetation, however there are six (6) layers of vegetation that make up a forest. The species composition of a forest is often unique to that forest, with some forests consisting of many hundreds of species of trees while others consist of just a handful of species. Learn more about forests. Butterflies - Great Spangled Fritillary (Speyeria cybele) - A note about its scientific name, Speyeria cybele is that "cybele" means “mountain mother” or “earth mother.” This is a large butterfly (wing span 2.5 to 4 inches) so it's very noticeable especially with the yellow orange colors. Their habitat is moist open fields, pastures, meadows, prairies, valleys, and open woodland. Males patrol open areas for females who lay eggs in late summer on plants of the violet species. The adult enjoys nectar from many types of flowers such as Verbena, Bergamot, Butterfly Bush, Red Clover, Purple Coneflower, Passion Flowers, Milkweeds, Ironweed, Joe Pye Weed, etc. The plant this adult is on is Stonecrop Sedum. It attracts more species of butterflies than I've seen on anything else, even the Butterfly Bushes we have around the property. There was a Painted Lady Butterfly on it a couple of hours ago. View Photos of Stonecrop Sedum and Butterflies. Another name for these handsome butterflies is Silverspots because of the metallic markings on their wings undersides. It's possible that this pattern, similar to a leopard’s spots, serves as camouflage when they are resting in places of dappled sun and shade spots. 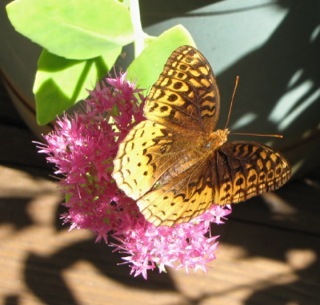 This is the most common fritillary in most of the Eastern United States and are not on any conservation lists. What's intriguing is that those hatched caterpillars don't feed until Spring when they eat the fresh grown violet leaves. Caterpillars hatch in the Fall and go to sleep right away without feeding. They sleep through the winter and will only awaken in the Spring at the same time as violet plants begin to grow. The timing is important to the hungry caterpillar. It is feared that global warming may disrupt this synchronization. Studies are underway to verify whether this is already taking place. Tidbit - Kellogg’s Cereal Tests Positive For Pesticides - A box of Froot Loops was sent to a lab for genetic testing and found 100% of the corn was GMO, containing both Roundup Ready and Bt corn as well as some Roundup Ready soy. Sugar is also a Roundup Ready GMO. Roundup Ready means the GMOs are sprayed with Roundup (glyphosate), a toxic weed killer [herbicide], which is absorbed by the plant. The lab documented a level of glyphosate residue in Froot Loops that gives significant reason for concern. Glyphosate was also patented by Monsanto as an antibiotic in 2010. Not only is the corn in Froot Loops sprayed with Roundup, but with the Bt trait, it is a pesticide in its own right, registered with and regulated by the EPA. Every cell of the Bt corn plant produces pesticides called Bt toxins. When rootworms bite into it, their stomachs rupture and they die. How disturbing is it that Kellogg’s is feeding children pesticides & antibiotics, without their parents’ knowledge or consent? GMOs were released into our food supply without independent long-term studies to prove that they are safe. The FDA ... allows the chemical companies that develop GMOs and profit from their sale to determine whether they are safe. The companies that create GMOs are the same companies that created DDT and Agent Orange, now banned, and which cause serious generational disease and birth defects. Read the full report on here. Sign a petition here. The EPA’s Chronic Reference Dose (RfD), which is supposed to represent the “safe” daily tolerance level, is nearly 6 times higher than the level set as an Acceptable Daily Intake (ADI) in the European Union. The EPA has set our Chronic RfD at 1.75 mg/kg of body weight per day. Despite the fact that children eat more food per pound of body weight, the amount is the same for children and adults, even though children are much more vulnerable. God is always good to us. In love He created this planet for man to enjoy. In love He came to Earth to be a sacrifice, one-time offering, for all of mankind (Hebrews 10:4). Even before we were born, and even when we were sinners, He chose to save us (Romans 5:8). What an awesome God! When you're facing a troubling problem, a sickness or disease, loss of a job, financial troubles, issues with your children or marriage .... magnify the Lord. Have you ever noticed that David when writing Psalms would often begin with all his problems and then end up praising the Lord and magnifying Him. Making God bigger in our hearts and minds will make our problems look a lot smaller. More than that it will build your trust in Him, which is when troubles begin to disappear. What's more real to you? The problem ... or already knowing that God can handle it and will. We connect with God by faith and faith requires trust. Jesus says we can rest in Him. First we have to lay that heavy burden down at His feet and choose to yoke up with Him for the journey. We may un-yoke ourselves every day to worry over it, but the more we focus on Him and His promises, the less we will think about the problem. May God's Blessings Surround You Every Day! Here's a link to the online version of this newsletter. Click on it and on the left sidebar there will be an option to share in various ways. Ready to Start Your Sugar Detox? Why Create a Backyard Wildlife Habitat? Can The Devil Hinder Your Prayers? Copyright and Reprint Information - All photos remain the property of Donna L. Watkins, but may be used with proper credit and link back to the website, TheNatureInUs.com. 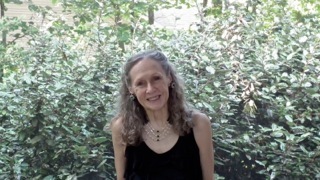 Articles written by Donna L. Watkins may also be reprinted with proper credit and link back to the website, TheNatureInUs.com.